Blood nourishes every cell of the body with water, nutrients and life-giving oxygen, making the flow of blood the river of life for the human body. The blood carries three types of cells, red blood cells (RBCs), white blood cells (WBCs) and platelets. 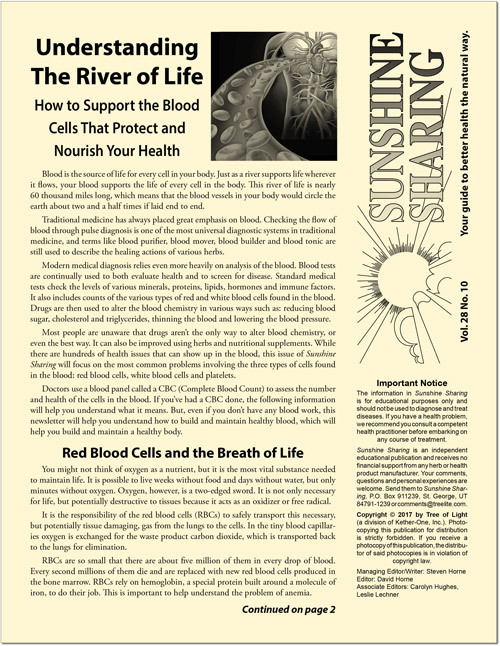 Learn about these three types of cells, what they do for your health and how you can keep these vital cells functioning properly in this issue of Sunshine Sharing. Sunshine Sharing is a great way to educate people about the many benefits of Nature's Sunshine Products (NSP). Each issue of this four-page newsletter covers how good nutrition and a healthy lifestyle, along with NSP’s quality herbs and supplements, can be used to build, regain or maintain good health. Easy-to-read, entertaining and informative, Sunshine Sharing is a great tool for building your NSP business. Sold in bundles of 25 copies, many successful NSP Managers and Distributors use Sunshine Sharing as a free monthly newsletter to promote their business. Sunshine Sharing can be used as handouts in your office or shop, or distributed as educational pieces around the community. Sunshine Sharing comes in bundles of 25 and is available to Sunshine Sharing Members for just $6 per bundle. Non-members can purchase issues of Sunshine Sharing for $10 per bundle.